I’ve added a few new skincare products to my routine lately, some of which I’ve been wanting to try for a while. My skincare collection is slowly improving, and becoming a regime I’m somewhat starting to enjoy doing. Is that a little sad? First up, the product that nearly all bloggers love; the hyped up Nuxe Reve de Miel Ultra-Nourishing Lip Balm. Yes, it’s the priciest lip balm I think I have ever bought, but I’m joining the club to say that it’s worth it. I’ve owned it for over a month now and I’ve barely touched the surface, therefore I’m hoping that it will last me a while. What’s different about this lip balm is the consistency; I’ve always been used to the jelly-like form, however this applies more like a cream and feels like a deep conditioner for your lips. I never suffer from flaky lips while wearing lipstick thanks to this, and I only need to apply it morning and night. I’ve been wanting to add a serum to my skincare routine for a while, and been rather unsure of what to go for to work with my combination skin. It can often seem dull during the colder months, so I was in the market for something to give me a glow and a good amount of moisture. That’s when I came across this little beauty during a shop round ASDA; N-Spa Radiant Flash Serum. I’ve always liked N-Spa’s bodycare, but never ventured into their skincare range until now. I absolutely love the scent of this product; the grapeseed oil smells so soothing but refreshing, and sinks in nicely to the skin. The serum appears to have shimmer in it, but doesn’t transfer to the skin to replicate that disco-ball look. It ultimately gives my complexion that needed glow before I apply my makeup, and I’ve fortunately had no breakouts since trying it as it’s suitable for sensitive skin. In my Halloween Lush Haul, besides the fun bath treats I also picked up some of their Grease Lightning to combat my blemishes. I find this product to be a good alternative to the harsh Panoxyl I use during a bad breakout, as it’s great for when you feel a spot under your skin. Like they say, prevention is better than cure, and this stuff really helps. I use this before bed on those little red lumps, and it seems to largely reduce them by the next morning. 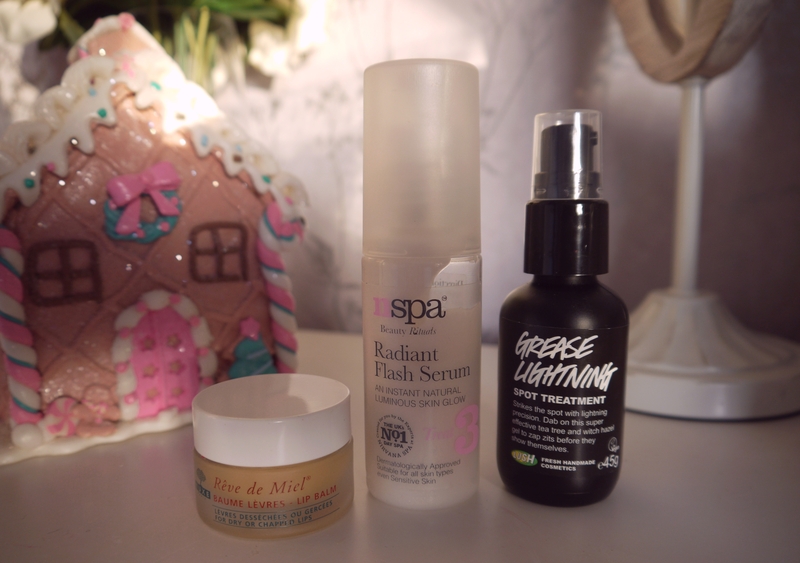 So these are my recent skincare additions! Have you tried any of these products?